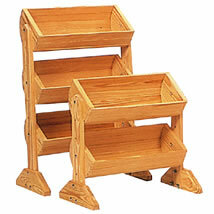 The Solid Wood Barrel Retail Countertop Displays are FDA approved for food items. The natural unfinished wood barrels are 18 in wide and great for displaying anything from snacks to shampoo. Great for impulse purchase items. Made from solid pine construction.